We leave Fort McMurray and hitch a ride to Fort MacKay, a Native community 40kms north, where we stay for three days. Celina, the elder with whom we stay, speaks of the trap lines from which she and her husband Edward once gleaned a life, and of the bushes teeming with berries that tickled this land before the tar sands plants opened, and stole their land, along with the health of the fish and animals. She lists the kinds of berries: raspberries, high bush cranberries, Saskatoon berries. She lists them off in circles, repeating the names, once, twice, three times, drawing attention to the abundance that she has no pictures to prove. She pauses after each name, breaking in remembrance to taste each one. We talk about quality of life. About how apples and tomatoes, rumour has it, aren't as robust, tasty or nutritious as they were in our parents' generation and that our parents' apples and tomatoes didn't measure up to those of previous generations either. Oranges and celery; mangoes and carrots; fish, moose; the vitamins of life. I read an article about it that recites percentages, that recaps parentages. Since the Alberta government implemented its Mineable Oil Sands Strategy in 2005, its priorities have been easier to justify and enforce: the area has been declared a "co-ordinated zone within which mining has the highest priority; policy is in place that specifically stipulates wildlife in the tar sands zone will not be protected before or during mining, "according to the Canadian Centre for Policy Alternatives. Young people, old people and people in-between are dying of cancer. The air here is laced by unrelenting stacks. Oil and water meet but refuse to coalesce in harmony. Like Celina, the people of Fort MacKay who live upstream from the plants get their drinking water from a source other than the river. Celina doesn't trust the water anyway and has met with oil plant representatives and observed for herself their unwillingness to drink tap water. As a result of one such meeting, Syncrude agreed to provide and pay for all the bottled water that she and her husband can drink. She smiles when she tells us that they hate her big mouth. The people living downstream from the plants, most notably in the isolated Native community of Fort Chipewyan (farther north and only accessible by plane), draw water directly from the Athabasca and are the most affected. Five cases of a rare cancer of the bile duct, cholangiocarcinoma, have occurred in Fort Chip's population of 1,200 in the past five years. Normally, only one in 100,000 people contract it. 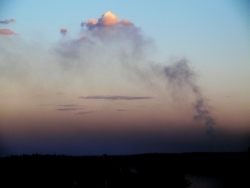 Years ago, Celina tells us, white, non-native people in the neigbouring town of Fort McMurray complained of difficulty breathing, and of green-black, deadly smoke being emitted from a Syncrude plant. As a result, the plant was closed down. She shows us pictures, not of high-bush cranberries, but of people she's known, and some she's loved. She tells us about her eldest son, who died six years ago. She speaks of how good-looking and kind he was. The neigbouring town of Fort McMurray, where he died, seems almost entirely populated by oil rig workers, or by those in close association. The town has seen massive growth in recent years: more people, more trucks, more drugs, violence and money. Before her son was stabbed in the heart by somebody she doesn't know, Celina knew it had happened. Our last morning in Fort Mackay we wake up to find that Celina has not returned from Bingo the night before. Just as we're beginning to worry, she arrives. She has spent the night in the hospital with her youngest son, Murray. "I think he ate a bad hamburger," she says. "Maybe food poisoning," she seems to hope. I find myself hoping as well. How serious can food poisoning be? White people who eat in fancy restaurants get it, so it can't be fatal. "The barbecue was brand new," she says. "You can't just cook meat on a brand-new barbecue. There are toxic chemicals all over these things--you have to get the factory off of it before you use it to cook with." She shakes her head at the floor and places her hand on the kitchen table to steady herself. "I don't trust other people's cooking. I don't trust it unless I've cooked it myself. I just don't trust it at all." She continues to shake her head, sadly. "A lot of people don't have a clue. They don't know how to cook a burger right. The woman who cooked it didn't even know that you can't just buy something from the store and use it right away. She probably had no idea. Half the time people have no idea they're eating poison," she says. We meet Billy in the only restaurant in Fort Chip. He works for Parks Canada as a firefighter, away from home. On days off, he has a few drinks. He drinks and has a lot to say. He tells us of his job at a tar sands plant, how it lasted three months. "They clear cut these huge areas," he says, "but instead of giving it to the elders for firewood or something like that, they just bury it all underground with their huge machines." He raises his voice in anger. "They've taken fish from this river with sores and puss all over them. They've even found fish with two heads," he says, eyes wide. "Indians are supposed to live to 100," he smiles, "but I know sooner or later, I'm going to catch something." He is well-built, athletic, and seems healthy to me. "These plants know exactly what they're doing," he says. "They don't care if they kill us all off. If we survive, it's a bonus, but if some of us die of cancer, oh well." I find myself wanting him to become the community activist, the one who makes the noise. He's got it; he should start something. "I buy all my food in the store. I don't touch any wild meat," he says. "Would you eat a fish with puss all over it?" When we ask if he drinks the water, he nods, solemnly. "My baby bathes in it." The fish plant in Fort Chip, not surprisingly, has gone straight downhill in the last 10 years. But the biggest problem, according to one employee, is the lack of fishermen. Apparently the government is making it harder and harder to get a fishing license. People can't afford to fish, and so they don't. Many believe that this is a government tactic, to keep the actual number of sick fish quiet. Billy invites us to sleep at his house and we meet his wife and three-year-old daughter. He is generous with his home and his food and insists that we help ourselves to anything, that when he visits Montreal he will expect the same. In the morning Billy seems to have lost some steam. He seems dejected and less eager to talk about the tar sands. But when we show him a video interview with Celina he pulls his chair up close and leans in to hear. He seems to agree with his entire body. On-screen Celina says: "Once they take all the oil out of this place, what are our kids going to live on? You can't drink oil. You can't eat money." "She knows what she's talking about," he says when it's over, shaking his head. "But what can you do?" He exhales, leans back in resignation and pats his daughter's head. I can see him thinking and I hear his outrage shifting back into motion by the sound of his breathing and the grinding of his jaw. He continues to stroke his daughter's hair. After a while, he says, "You know, maybe I will get some guys together and start something." He sits up straighter. We shake hands to say goodbye. When the door is closed I lose sight of everything but Billy and his daughter and a sad part of me wants him to leave while he can.